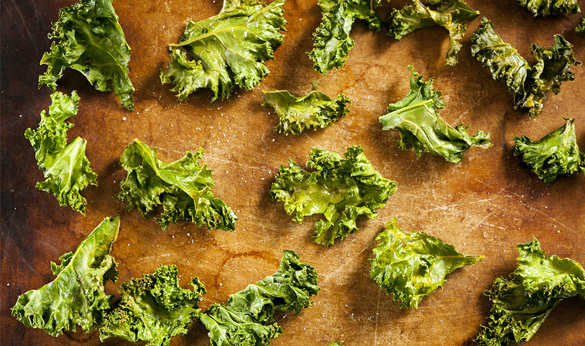 Preheat your oven to 300 degrees F. Take 1 bunch of kale leaves and wash and dry them. Run your knife down both sides of the tough center stem and discard the stem. Cut or tear into large-ish size pieces and toss with olive oil and sea salt (to taste). Spread in a single layer on a baking sheet (preferably lined with either parchment paper or a sil-pat liner) and bake for approximately 15 minutes. Watch carefully toward the end of baking, the chips should be crisp, but not brown.